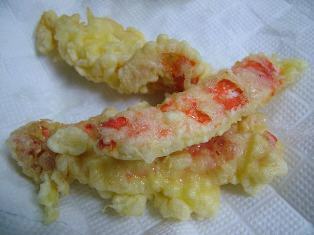 Kani no Tempura ('カニのてんぷら', is classified into deep-fried dish), is known as Crab Tempura in English, and 螃蟹天妇罗 (Pángxiè tiān fù luō) in Chinese. It is the washoku. Egg, Tempura Flour, Oil, Crab (King Crab, Horsehair Crab and so on).